The Privateers (15-15) began the 2017-18 Southland Conference tournament the way they ended the 2016-17 event -- by eliminating Texas A&M-Corpus Christi, this time by an 83-76 score. Playing the tournament without their top two scorers, New Orleans dominated from the jump, shooting a blistering 68% in the first half and leading by as many as 17 before settling for a 43-29 halftime edge. However, the second half was a different story. UNO cooled off and was unable to keep its turnovers down, committing 21 for the game. Meanwhile, the Islanders, who missed their first 10 three-point attempts, hit four late and got as close as 4 with 1:11 left, but Damion Rosser hit a critical follow-up off a Makur Puou fast break layup miss to stem the tide. 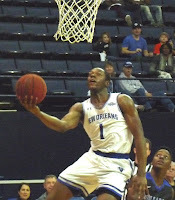 The freshman Rosser led the Privateers with 17 points, while junior Ezekiel Charles added 15. Rosser and Charles also nabbed 7 rebounds apiece. Scott Plaisance also contributed 13 for the winners. The Islanders' Joseph Kilgore was huge in a losing effort, posting a game-high 29 points. New Orleans' victory means they hit the floor again tomorrow to play 4th seeded Sam Houston State, again a 5 p.m. tip. The Privateer women will begin their tournament at 1:30 against Abilene Christian.